Today, with over 60,000 seats the Oakland Coliseum looks very different than when it opened. In the mid 1940s Oakland officials first proposed that a new stadium be built in the area to attempt to lure a professional baseball and football team. It was 1960 before a site was chosen to build the stadium, near the C.W. Nimitz Freeway. Construction on the multipurpose stadium began in 1962. The stadium was constructed deep in the ground allowing fans to enter on the upper deck level. Originally named the Oakland Coliseum, it was completed in four years. The Oakland Raiders played the first game ever at the the coliseum on September 18, 1966. For years fans had strongly supported the Oakland Pacific Coast League franchise. Because of this Kansas City A’s owner Charlie Finley decided to move his baseball team to the Oakland Coliseum after the 1967 season. The Kansas City A's were renamed the Oakland A's. The A's played their first game on April 17, 1968 when 50,219 fans packed the three tiered stadium. Built in a circular shape, many of the seats stretched from foul pole to foul pole, with bleachers beyond the outfield fence. Two Diamond Vision video/scoreboards were located above both the left and right field bleachers. Over the years, few changes took place at the Oakland Coliseum. The Raiders moved out of the coliseum to Los Angeles in 1981 but moved back in 1995.The coliseum remained an excellent place to watch a ballgame until 1995 when the Raiders moved back as drastic changes occurred at the Oakland Coliseum. Network Associates Coliseum in 1998. After the 2004 season, the stadium was renamed again and was known as McAfee Coliseum. After the 2008 season McAfee chose not to renew their naming rights contract and the stadium name reverted back to its original name, the Oakland-Alameda County Coliseum. In April 2011 Overstock.com purchased the naming rights to the coliseum for six years at $1.2 million annually. In June 2011 the coliseum was officially named O.co Coliseum. In March 2016, Overstock ended their namings rights agreement with the coliseum, and it is now known as the Oakland Coliseum again. Beginning in 2006, the A's closed the third deck of Oakland Coliseum moving fans closer to the action and making the stadium more intimate. Although the coliseum can seat over 60,000, the official capacity is just over 35,000. Fans can easily arrive at the stadium via the BART Metro or drive and park in many of the lots that surround the coliseum. Before the game, fans can be found tailgating, discussing baseball and enjoying each others company. Upon entering the stadium fans can easily access their seats in the first or second levels. The main concourse serves both the lower and second decks of the stadium allowing easy access for fans wanting views from different parts of the stadium. An all you can eat section is located in three sections of the upper deck directly behind homeplate. Only fans with tickets to this section can access these seats. New for the 2015 season are two new 36 feet high by 145 feet wide HD video/scoreboards. Costing $10 million they replace the existing dot-matrix videoboards. The Athletics continue to seek to have a new ballpark built to replace the five decade old coliseum either in the City of Oakland or San Jose. Plans to build a new stadium have yet to materalize. 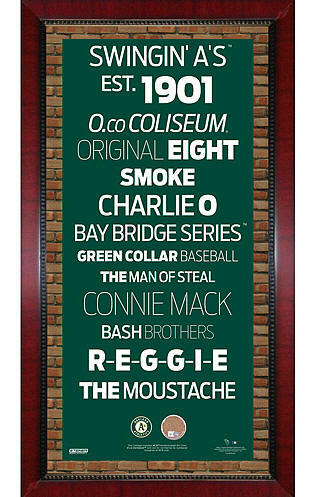 Click to Enlarge Pictures - Buy Your Favorite Oakland Coliseum Pictures Here! 49 homeruns by rookie Mark McGwire in 1987. Catfish Hunter's no hitter on May 8, 1968. 1973 AL MVP Reggie Jackson. Cy Young Award winner Dennis Eckersley in 1992. Rickey Henderson steals 132 bases in 1982.